Sutejo floats around the rivers of South Jakarta on a blue foam mattress which enables him to collect materials, mostly plastic and discarded items that he sells to a recycling company. 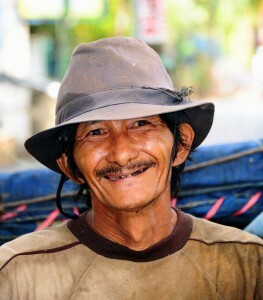 On a good day Sutejo earns Rp.50,000 rupiah but some days he only takes home Rp.10,000. His greatest achievement in life has been putting two of his kids through high school after his wife died tragically giving birth to their third son. His daughter is now 23 years old and is the principal of a high school and his older son, 25 years old, works at a car dealership. His youngest is just 12 years old and about to go to high school. What he enjoys most about his job is the opportunity to contribute to a cleaner environment by recycling and he enjoys the freedom of working for himself, however after doing this job since 1987 he gets very tired at times. The rainy days are a blessing for Sutejo as on these days he collects plenty of materials as they wash down the rivers into his waiting hands. He tells his kids that he is a construction worker as he does not want them knowing that he collects rubbish, something he is embarrassed about. Whilst he believes he has a fairly hard life he is glad in his heart that his kids have been successful and he takes great pride in this.